That photo fits into this weeks photo challenge in so many ways! Our spare time is spent escaping work and going on as many adventures as we can. That usually means heading out on or in the water. The big blue ocean is like therapy for us. This weekend we made the double escape. We escaped land, and because the water was so much warmer than the air, we escaped the cold by being in the water as long as possible. 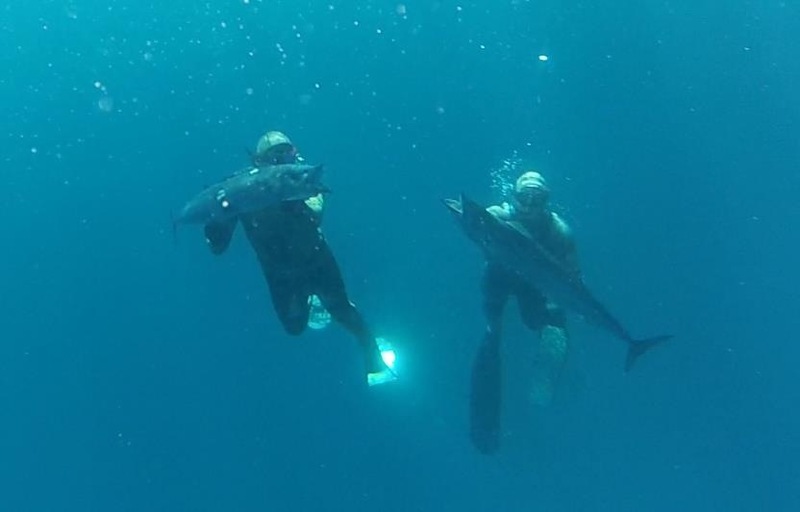 The wahoo shown in the photo managed to escape us on the Saturday, but failed their escape attempt on Sunday. It’s their own fault for being so inquisitive anyway, and should have learned their lesson the first time. I have just escaped work and am eager to cook up our catch, starting with some wahoo sashimi. Do you think I can say the word escape in this post any more times? Pawesome photo guys! Looks like you’re having a blast! looks like you guys are doing a lot better than me lately! nice catch!